Sugarland, Texas, a place where diversity is embraced. America's third "Best Place to Live" may be better known in New Delhi and Shanghai than it is here. It sounds like the American dream, the hometown we all seek for our families – an attractive and friendly city with affordable housing, great schools (72 National Merit semi-finalists in 2008), low crime (the fifth safest city in America, according to the FBI), numerous community organizations and activities for the kids, beautiful parks and green spaces, and plentiful, high-paying jobs. No wonder Sugar Land, Texas, was ranked third in the CNN/Money Magazine annual "Best Places to Live" list, eighth in the 2006 book Best Places to Raise Your Family in the United States and cited by Business Week as one of America's 25 best suburbs. Perhaps the most surprising fact about Sugar Land, however, is its incredible diversity. 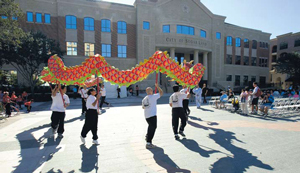 Due to the city's phenomenal growth rate (more than 300 percent since 1990), figures should be more precise with the 2010 census, but according to estimates, Asians (mostly Chinese, Indian and Pakistani) constituted over 30 percent of Sugar Land's population, while Latinos and African-Americans make up nearly another 15 percent. Meanwhile, according to some figures, the proportion of whites as a percentage of the population has decreased to 50 percent or less. Brown University sociology professor John Logan has tracked changes in racial composition in metro areas since 1980, paying special attention to the balance of whites, blacks, Hispanics and Asians. He found that in areas that show significant percentages of blacks, Hispanics and Asians, there is a very strong emerging trend of co-habitation, "as opposed to the old pattern of suburbs of all-white neighborhoods with enclaves of black or Hispanic settlement." What is happening in Sugar Land is representative of a "growing number of neighborhoods with substantial presence of all four groups." Numbers are only the beginning of this story. In this city of 80,000, it is possible to attend public celebrations for Diwali, Easter, Tet, Hannukah, Cinco de Mayo, and Kwanza. On the ground, Sugar Land is chock-a-block with an array of ethnic restaurants, dance schools, and stores selling clothing, food, house wares, and music from Karachi, Mumbai, Guadalajara, and Hong Kong. In addition, unlike many other multicultural areas, there are few enclaves – residential or commercial – composed predominantly of one ethnicity or another. Rather than a Chinatown or Little India, mom-and-pop ethnic businesses tend to be scattered willy-nilly throughout the city's commercial zones. In a single strip mall there may co-exist a dim sum joint, florist, Kinko's, Vietnamese beauty salon, discount tire shop, Whataburger, and Pakistani grocery. There are also plenty of places of worship for the faithful of all backgrounds. The Sugar Land area is home to the flourishing Baptist, Lutheran, Methodist and Catholic churches, as well as the Jewish, Mormon and Jehovah Witness congregations. It also offers a Bah·'" temple, the Vietnam Buddhist Center, the Islamic Society of Greater Houston, the Radha Krishna Organization, the Ashta Lakshmi Temple, The Aga Khan Center, and, most notably, the Bochasanwasi Swaminarayan Mandir, a 25,000 square foot Hindu temple constructed of 33,000 pieces of solid Turkish limestone and Italian marble, hand-carved in India and shipped to Texas. This impressive edifice, with its gleaming, soaring white towers and domes, was the first traditional Hindu temple to be built in the United States and is the second largest outside of India. In short, this overwhelmingly republican city (a long-time base of former Republican House Majority Leader Tom DeLay; 72 percent of its voters cast their ballots for George Bush in the 2004 election) in the heart of Texas and the Bible Belt, may well be one of the most tolerant and culturally rich suburbs in the United States. 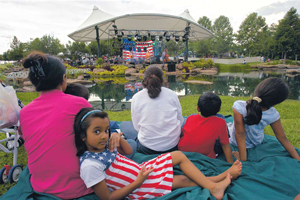 Sugar Land's warm welcoming of immigrants and foreign-born residents is only fitting, given the role of immigration and race relations rooted in the founding of Texas itself. In 1828, Texas was still a province of Mexico, part of the northern territory known as Coahuila y Tejas. In pursuit of a land grant given to his deceased father by the old Spanish empire, the young Stephen Austin traveled the 1,000 miles to Mexico City to request reauthorization of the grant. However, the Mexican republic had itself only recently won sovereignty from Spain after a harrowing 11-year war of independence, and was suffering birth pangs and upheaval. It was not until two years and several changes in immigration law later that the Mexican government finally agreed to allow limited immigration to Texas. The law required that the settlers convert to Catholicism and take Mexican citizenship, but these provisions were unenforced and largely ignored. Between 1823 and 1829, under Austin's sponsorship, 1,200 American families moved into the area between the Brazos and Colorado Rivers, looking for land and opportunity. Indeed, it was the passing of more stringent immigration controls in 1830, as well as Mexican President Anastasio Bustamante's demand that slavery be curbed (by 1836 there were 5,000 slaves in Texas), that angered the American settlers and eventually led to the Texas Declaration of Independence. As for Sugar Land, it was settled as Oakland Plantation by Samuel Williams, who had proved himself invaluable to Austin as a translator and secretary, thanks to his excellent command of Spanish learned in Argentina. Williams then sold the land to his brother, the founder of what would become today's Imperial Sugar Company, which is still headquartered in Sugar Land. For a hundred years Sugar Land was a company town, containing little more than Imperial's factories and living quarters of its workers. Finally incorporated in 1959, it remained for decades a sleepy town, 25 miles from the hustle and bustle of Houston. When speaking of Sugar Land's successes, analysts like to point to the progressive municipal leadership, careful community zoning and planning, and forward-thinking strategizing that has lured corporations and produced a profitable blend of commercial and residential sectors. The arrival of big business has played a huge part of the synergistic picture, providing a thriving job market, mostly in the technological, software, engineering, and energy industries. During the first half the decade, job growth exceeded 30 percent, and projected to come in as second in the country for the second half of this decade. These jobs in turn have drawn educated professional newcomers from all corners of the world. Sugar Land is now known in Taiwan, Hong Kong, India, and even mainland China. As one long-time resident comments, "When I go back home to India, everyone there has heard of Sugar Land." An educated and skilled pool of workers has attracted more new companies, and growth has spiraled ever upward, along the way producing even more jobs and opportunities for the businesses that serve the increasing population. Sugar Land is now the fastest growing city in Texas (having overtaken Galveston as the second-largest city in the Houston metro area), and is the third-fastest growing community in the United States. In addition to the booming job market, a perfect storm of factors make Sugar Land an especially welcoming place to live for residents with origins in India, Pakistan, China and Vietnam. Immigrants from those countries, especially in the first generation, tend to be strongly family-oriented and conservative, both politically and socially ñ attitudes very much in the majority in Sugar Land. In addition, to be found are the convenience and comfort of familiar foods, products and organizations, and friends and neighbors who speak the same language and share the same culture. Numerous businesses, including travel agencies, law practices, and tutoring centers offer services in Mandarin, Cantonese, Urdu, Hindi and Vietnamese, and a theater has recently opened showing the popular musical extravaganzas known the world over as "Bollywood" movies. The Houston area boasts daily radio programs playing all genres of music from the Indian subcontinent, from masala to bhangra, two Vietnamese language radio stations, one Vietnamese language television channel, more than a dozen Spanish language stations and three Spanish language television channels. Even the area's notorious near-tropical heat and humidity, which can serve as a deterrent to those from northern regions, is unproblematic and even desirable to those who grew up in similar climates. Interestingly, a very strong case could be made that despite the varied ethnic and religious backgrounds of its citizens, Sugar Landers are more homogenous than not. Like the rest of the population, Sugar Landers of foreign extraction are mostly family-aged adults with children, mostly well-educated, highly paid professionals and mostly republican. The household income in Sugarland is more than $100,000 (vs. the national average of $48,000) and 65 percent of adults are college educated. Thus, the usual socioeconomic factors associated with anti-immigrant bias are moot. Because Sugar Landers meet on common ground at the office, school parking lots, and in their neighborhoods, it is easier for them to meet on common ground on matters of religion or diversity. Even gated communities, neatly kept boulevards, landscaping guidelines, and strict zoning can't keep trouble out of paradise completely. In December 2006, the South Zone location of the Islamic Society of Greater Houston (ISGH), informally known as the Sugar Land mosque, was vandalized and defaced by students from Dulles, one of Sugar Land's top high schools, causing nearly $8,000 in damages. The mosque, under the leadership of its director, Jawaid Iqbal, immediately took action to defuse the situation, offering amnesty to any perpetrators who would step forward. When one of the three did, the mosque not only asked the court not to press charges, they also declined restitution. In the days that followed, mosque members worked actively with the perpetrator, his family, the county court system, Stafford and Sugar Land city governments, the Honey Brown Hope Foundation and the Anti-Defamation League, among others, to organize a seminar discussing the incident, as well as the general subjects of Islam, tolerance and diversity. Although there have been quiet grumblings about Asians "taking over" the city, most citizens seem adamantly supportive of Sugar Land's cultural inclusiveness and diversity. City Hall cooperates actively in the Anti-Defamation League's Community of Respect program, and co-sponsors the Chinese American Professionals Association's annual Diversity Summit. When ground was broken for the new city hall building, a number of diverse faith congregations were invited to make invocations. One of Mayor David Wallace's first actions in office was the formation of a Multi-Cultural Task Force, whose mission and objectives were shaped by a gathering of more than 30 of Sugar Land's ethnic and faith community leaders. 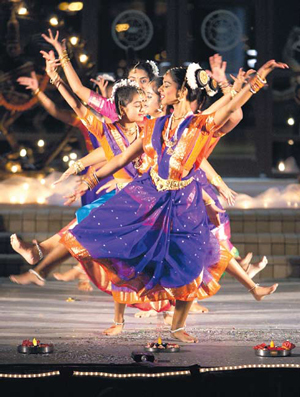 City officials are encouraged to attend events of ethnic and religious groups around the city.